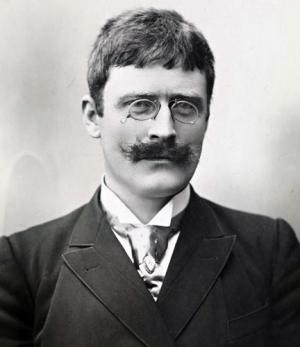 Knut Hamsun was charged with treason because of his Nazi sympathies. All this week, Norway is feting a writer who was lucky to escape being shot for his shameless collaboration with the Nazis. Knut Hamsun was either, according to taste, one of the greatest figures in world literature, or a vile old man with a head full of nasty ideas who betrayed his country. Not many years ago, anyone who went into a Norwegian bookshop and asked for one of Hamsun’s books was likely to get a frosty reply from across the counter. And yet he was, to be blunt, the only world-renowned novelist that country has yet produced. This week, the town of Hamaroey, 200 miles north of the Arctic Circle, where Hamsun grew up, has been celebrating six consecutive ”Hamsundagene” (Hamsun Days), with seminars, meetings and exhibitions dedicated to the writer, to mark the 150th anniversary of his birth. The festivities kicked off on Tuesday, with the formal opening of Norway’s first Knut Hamsun museum, by Crown Princess Mette-Marit and the Culture Minister, Trond Giske. There is a musical in preparation, based on his work, and his face will appear for the first time on a Norwegian postage stamp. Getting the museum to open has taken 15 years of planning and prevarication, because of Hamsun’s appalling behaviour in old age. The design, by the American architect Steven Holl, won the Progressive Architecture Award as far back as 1996 but it took until 2007 for the government to allocate the money, as it grappled between its anxiety to remember a fabulous writer, and to forget a traitor. His case poses an old question about art and morality – whether it is permissible, or even possible, to enjoy the music of Carl Orff, or the poetry of Ezra Pound, or Hamsun’s fiction, and overlook the sort of people that they were in life. Baruch Tenembaum, who founded the International Raoul Wallenberg Foundation, named in honour of a Swedish diplomat who saved thousands of Jews from Nazi death camps during the Second World War, thinks not. He has written to the Norwegian government to say that he was ”astonished and concerned” that they should be celebrating a man who collaborated with ”one of the most sinister regimes in history”. Mr Tenembaum told Reuters: ”We cannot understand how Norwegians can honour someone who was a criminal and was inciting crimes. Except, of course, that Hitler was not a good painter, whereas Hamsun was a giant of world literature. What Edvard Grieg was to music, or Henrik Ibsen to drama, or Edvard Munch to art, Hamsun was to literature. The French writer André Gide put him on a par with Dostoevsky, but thought Hamsun was the more subtle. Ernest Hemingway urged F Scott Fitzgerald to study him. To Isaac Bashevis Singer he was the ”father of modern literature”. Hamsun’s best-known novel, Hunger, first published in 1890, has never been out of print and it is still sold in the UK. It is the fictionalised memoir of a youth driven by an ambition to write who is starving to death in what was then the capital of Norway, Christiana. Utterly wrapped up in himself, and interested in no one else, he is completely alone in a crowded city. The author had no literary training. But his collaboration with the Nazis cannot be put down to ignorance, or compared with the case of PG Wodehouse, a political innocent who found himself living under Nazi occupation and who later confessed that he had been a complete fool to agree to broadcast on German radio. Hamsun’s Nazi sympathies were the natural outcome of prejudices he had harboured for years. He did not like big cities and had mystic ideas about men and people returning to their ancient rural roots, which chimed with Nazi mythology. He was a life-long admirer of German culture. He backed the Germans in the First World War, supported Norway’s fascist movement in the 1930s, and when Norway was under Nazi occupation, he met Hitler and gave Goebbels the Nobel Prize Medal for Literature that he had been awarded in 1920. Neither did he relent or apologise when the war was over. A week after Hitler committed suicide, Hamsun wrote an obituary praising him as ”a warrior for mankind”, ”a prophet of the gospel of justice for all nations” and ”a reformer of the highest sort”. PG Wodehouse was trapped in occupied France in 1940, travelled to Berlin and made five humorous broadcasts on German radio. It did not cross his mind that he would be considered a traitor. Despite a huge public outcry, he was cleared, and received a knighthood shortly before his death in 1975. But he never returned to the UK. Ezra Pound, one of the greatest American poets of the century, met Mussolini in 1933, and spent the war in Italy making hysterical anti-Semitic, pro-fascist broadcasts. Arrested in 1945, he narrowly escaped execution and spent 12 years in a hospital for the criminally insane. Carl Orff, composer of the raunchy opera Carmina Burana, lived and prospered in Germany throughout the Third Reich, but lied his way out of trouble by fooling a de-Nazification court into believing that he had joined the White Rose resistance movement.